While critics of the recent US-North Korea summit correctly maintain that the event was long on publicity and short on progress, it would be unrealistic to expect lasting revolutionary change so soon. It was one of those I-Cannot-Believe-This-Is-Happening moments. President Donald Trump just did what no other president in American history was able to do. Sixty-five years after the end of the Korean War, he sat down with the leader of North Korea, a government that is a leading member of the Axis of Evil and an ardent foe of the United States. 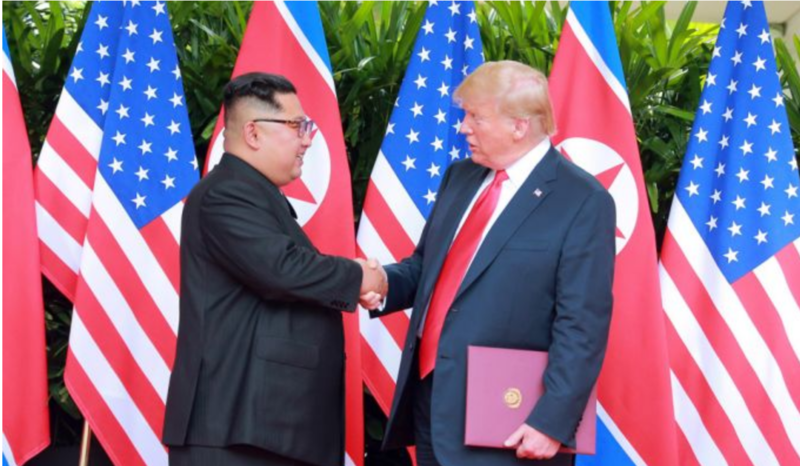 The two enemies, who only a few months ago were threatening to blow up each other’s countries, now smiled at each other, exchanged a few pleasantries, and at the conclusion of the approximately four hours of talks, they both signed an agreement which calls for the United States to provide “security guarantees” to North Korea and which envisions the “complete denuclearization of the Korean Peninsula”. “We’re going to take care of a very big and very dangerous problem for the world,” said Mr Trump. But now, since the leaders of the US and North Korea concluded their historic summit in Singapore on Tuesday, Mr Trump’s critics joined by the Mainstream Media have not stopped whining, complaining, and frothing at the mouth. It seems that they were led to believe that after an hour or maybe two following the end of the summit, North Korea’s Mr Kim would be able to rid his country of its entire nuclear arsenal, announce that he was opening his country to American investment, choosing to be vegetarian and becoming the head of the North Korean chapter of the #MeToo movement. Then the two former adversaries, joined by a sense spiritual unity and interpersonal harmony, would pledge to let old fears and animosities blow away, and to usher a new era of peace and cooperation. And finally, the Donald and Chairman Kim would hold hands, and overjoyed and a bit tearful, they would start singing, the Beatles’ famous anti-war song, Give Peace a Chance, and as they disappear into another of Singapore’s lovely sunsets, getting ready to paint the town red and dance the night away, or perhaps just two dudes having a Double Cheeseburger at the local McDonald’s, we would all be assured that they and everyone else would then live happily ever after. My guess is that even if all of the above had happened in some alternate universe, Mr Trump’s detractors would still have grumbled about something. Hey, the two new BFF’s were not dining in a gluten-free restaurant. They also both looked so not Justin-Trudeau, so un-cool, so not metrosexual, so Harvey Weinstein, and carrying so much weight they are certainly not good models for our kids. And bottom line, can we really believe anything Mr Trump says? Now, if only Barack Obama was still in office. American television pundits complained that by meeting Chairman Kim, President Trump helped turn one of the most evil men in the world, a tyrant who imprisons, tortures and kills his own people, and made him look like a really nice guy – and he did that after being so un-nice to poor Prime Minister Trudeau – and provided his dictatorship with a sense of legitimacy. As though no other American president has never wined and dined, and signed agreements, with dangerous dictators, including with some of the political monsters of the 20th Century, including mass killers like Joseph Stalin and Mao Zedong, not to mention the recent nuclear deal with the Ayatollahs in Iran, the one Mr Trump is now being attacked for revoking. So Mr Kim has reaffirmed his unwavering commitment to complete “denuclearization of the Korean Peninsula.” Big deal! He probably doesn’t mean it and President Trump is naïve if he trusts this guy to keep his promise, contend the professional Trump haters on left and right. But guess what? International agreements, like the one signed in Singapore this week, are not supposed to usher heaven on earth or to make us love each other and sing Kumbaya around the campfire. They are usually not negotiated with the likes of Mahatma Gandhi or Mother Theresa, but with our former enemies as we operate under the hope that such agreements would avert future wars in which hundreds of thousands, if not millions of innocent civilians would die. Making a deal with the leader of the Hermit Kingdom would probably not turn North Korea into another peace-loving Switzerland. But taking a step that would ensure that Seoul would not be destroyed is a goal worth pursuing. And even Mr Kim would not be transformed into a liberal democrat anytime soon, an agreement that could potentially open his country to trade and investment and create the foundations for cooperation with South Korea, should not be dismissed by human rights advocates. We need to recall that when Ronald Reagan met Mikhail Gorbachev in Iceland, in 1987, some of the same critics who are now criticising the Trump-Kim get-together, were quick to report that summit as a failure, with some pundits suggesting that the reformist Soviet leader was a fraud, that he was trying to fool the Americans, that he could not be trusted. Although at the time it did not achieve more than a pledge on both sides to cooperate, we now regard the Reagan-Gorbachev meeting as a history-changing event. American brought the Soviet Union from the cold and welcomed it into the community of nations. Reagan was also being criticised for coddling a dictator and for being naïve for trusting Mr Gorbachev. But not unlike Mr Trump, Reagan was a long-time military hawk, who believed that you can only foster peace with an enemy, by making it clear that you are willing to go to war to protect your interests. And quoting an old Russian proverb, Reagan insisted that any nuclear disarmament agreement with Moscow should be based on the concept of “Trust, but verify!” which is probably the way the Trump Administration would be approaching the coming negotiations on de-nuclearizing the Korean Peninsula. Indeed, the background music for Reagan’s negotiations with Mr Gorbachev did not include John Lennon’s Imagine (“Imagine all the people living for today/Imagine there’s no countries/It isn’t hard to do”). He pursued a hard-core Realpolitik strategy that eventually transformed not only the relationship between Washington and Moscow, but also the entire global balance of power. Be sure to finish reading this article at the Business Times online! Leon Hadar is a global affairs analyst who holds a Ph.D. in International Relations from American University. He is a journalist and blogger, whose writings have appeared in The Huffington Post, National Interest, Chronicles, Reason, and Haaretz. He also serves as the Singapore Bureau Chief for the Business Times. Hadar is a contributing editor to The American Conservative. He was a Mideast policy analyst at the CATO Institute, where he routinely criticized American foreign policy in the Mideast. Further, Hadar authored two popular books on U.S. foreign policy in the Middle East, “Quagmire: America in the Middle East” (1992) and “Sandstorm: Policy Failure in the Middle East” (2005).